The pendulum that measures emotion and performance swings quite wide in college football. Witness the last couple of years as it relates to Penn State football. Even when you factor the Nittany Lions’ improvement and scholarship restoration, the separation is much less significant when playing at home. The Lions have lost at Ohio State by a combined 77 points on their last two trips to the Horseshoe — 63-14 in 2013 and 38-10 in ’15. Ohio State’s last two trips to Beaver Stadium saw the Buckeyes escape in overtime and then fall victim to a 24-21 shocker last year. How about Iowa? Last year at Beaver Stadium, the Hawkeyes almost looked like they quit in a 41-14 loss. The next week they turned around and beat Michigan, 14-13, and threw a mighty scare into Penn State less than a half-season later. Both of those games were at Kinnick Stadium. Speaking of the Wolverines, a year ago UM spanked Penn State 49-10 at the Big House, a favor that was returned in full last week at Beaver Stadium, as the Harbaughs limped home on the short end of a 42-13 score. Which leads us into today. James Franklin didn’t wait for questions during his Tuesday availability to frame the massive challenge awaiting his 7-0 and second-ranked Lions at Ohio Stadium. He brought it up in his opening remarks. That’s why No. 6 Ohio State (6-1) was installed as a touchdown favorite, which is actually a show of respect for Penn State based on past history. Since the Lions joined the Big Ten in 1993 — already a quarter century ago — Ohio State is 6-6 at Beaver Stadium and 10-2 in Columbus. The difference is the Buckeyes were blown out in State College once (63-14 in 1994, when everyone was blown out), and Penn State almost never scores more than one touchdown at the Horseshoe. The Lions’ average margin of defeat in 10 conference losses at Ohio Stadium is a staggering 24.7 points. If Penn State is as good as the track record it has established over the past 17 games indicates, we should at least see a competitive game — one that has a chance to live up to its billing as the game of the year, at least so far, in the college football season. But will be it a victory, a stamp that this team could be on its way to a second straight Big Ten East Division title and all that goes with it — another trip to Indy where it would be favored over Wisconsin with a berth in the College Football Playoff on the line? With the calendar about to flip to November, all that’s available to the Lions today makes this one of the biggest regular-season games in their history, maybe even the biggest. Penn State’s current No. 2 ranking is the program’s highest since 1999 when the Lions imploded in November. And it’s the highest ranking the Lions have ever taken into Columbus (for some reason, the ’99 team somehow played both the Buckeyes and Michigan at Beaver Stadium). The common denominator that aligns Penn State’s greatest teams was the ability to succeed on the road. Whether it was 1981 at Pitt, the 1986 team winning at both Alabama and Notre Dame or the 1994 team making good on its first trip to Michigan, those teams had the mental toughness to handle a road environment equal to what Beaver Stadium has become for its guests. Further, Penn State’s best teams have never been overly bothered by the weather, which calls for less than ideal conditions today. 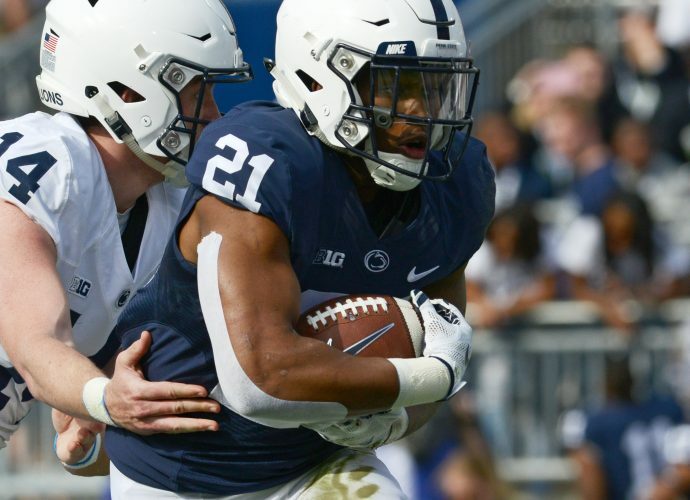 Combine the best opponent on the schedule, at home and rested from a week off, eager to atone from last year’s loss, desperate not to stumble again after already losing to Oklahoma with a weather factor, and it adds up to a perfect opportunity for Penn State to find out just how good it really is.